With Labor Day weekend right around the corner, we’re all on the hunt for some delicious, healthy, and quick recipes to take to those weekend cook outs. We all know watermelon is the perfect summer fruit, but with its season coming to an end in September, now is the perfect time to eat it all up while you can! 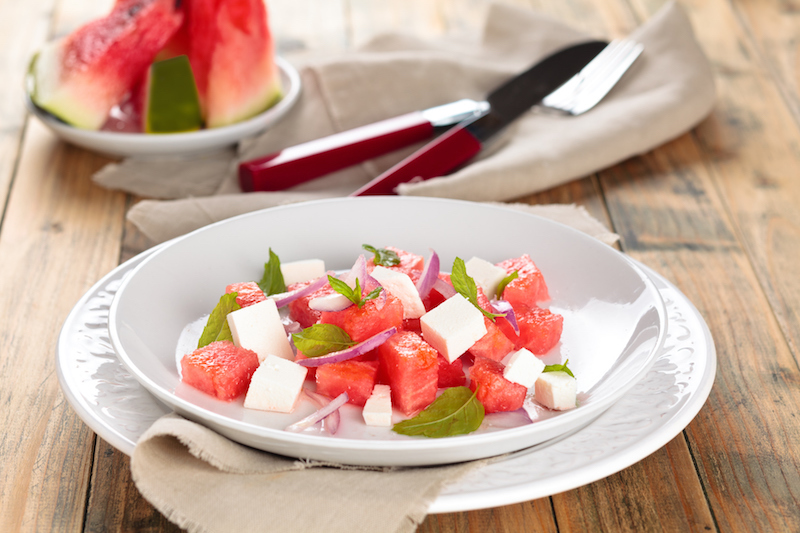 It’s no secret watermelon is delicious all on its own, but have you ever tried it paired with balsamic and feta in a salad? If not, Labor Day is the perfect excuse to make this quick balsamic watermelon feta salad from Layers of Happiness that promises to hit the spot. *Percentages for recommended daily intake from Healthline.com. Accessed August 2017. REFERENCES: 1. Balsamic Watermelon Feta Salad. Website. http://www.layersofhappiness.com/balsamic-watermelon-feta-salad/. July 28, 2014. Accessed August 22, 2017. 2. MS, RD, Jennings, Kerri-Ann. The Top 9 Health Benefits of Eating Watermelon. Website. http://www.healthline.com/nutrition/watermelon-health-benefits#section3. August 18, 2016. Accessed August 22, 2017. 3. Foods to Avoid During Pregnancy. Website. http://americanpregnancy.org/pregnancy-health/foods-to-avoid-during-pregnancy/. Updated July 20, 2017. Accessed August 22, 2017. 4. Folate Dietary Supplement Fact Sheet. NIH Website. https://ods.od.nih.gov/factsheets/Folate-HealthProfessional/. Updated April 20, 2016. Accessed August 22, 2017. 5. What is Spinach Good For? Website. http://foodfacts.mercola.com/spinach.html. Accessed August 22, 2017. 6. Primacare™ Prescribing Information, Avion Pharmaceuticals. October 2016. 7. Scholl TO, Johnson WG. Folic acid: influence on the outcome of pregnancy. Am J Clin Nutr. 2000; 71(Suppl):1295S–1303S.